Oconee Events is a freshly innovative boutique-style rental company offering full-service special event & party rentals. Our collection includes everything you need for your next event including tents, seating, tables and more. Whether you’re planning a corporate event, a luxe wedding or a raucous graduation party, Oconee Events has you covered. Lest you think we’re your usual, hum-drum event rentals company who just drops off chairs and picks them back up, boy, are you in for a surprise. With an event planning mentality as a part of our service, we help you plan, coordinate & carry out your event. Planning a backyard wedding? No problem! We’ll not only supply the chairs, tables and tents; we’ll plot out the best placement based on the dynamics of your site. 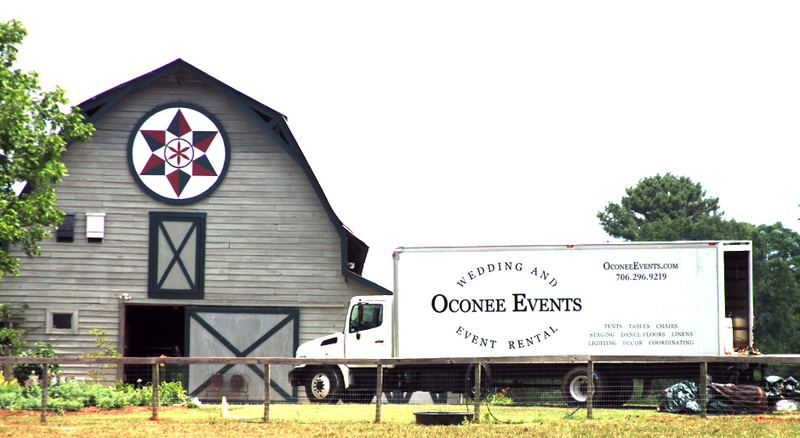 At Oconee Events, you hire an event rental consultant when you reserve our rentals. We will interpret your vision and see it through to the end. We’re not just about comfortable chairs… planning, designing and styling is where our expertise lies. And we’re not just about weddings either. We love a good party and have super fun planning some spectacular social, corporate and non profit events. We make it our mission to assist all you brides, event coordinators and one-time party planners in finding all the right products for your big day. We are family-owned and operated to bring our customers peace of mind as well as the equipment necessary to carry out whatever theme your little heart desires. A division of longtime local company, Grand Rental Station in Watkinsville, we are eager to work with you on your next event. Rhett Hall, a charismatic guy with big ideas, owns Oconee Events and thinks he has the best job in the world. After struggling to put together his own wedding a few years ago, he decided that Athens and the surrounding areas of Georgia were in desperate need of a new wedding and event rental source with up-to-date products, a fresh perspective and great customer service!